I have a big sweet tooth, but with living a healthy life style and being gluten and dairy free, I have to balance my sweets. 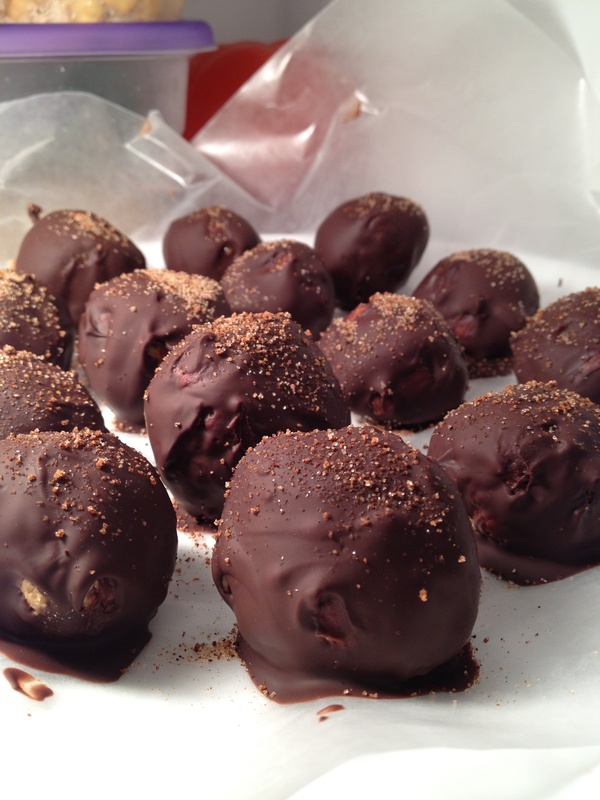 I was looking to satisfy that sweet tooth and made these peanut butter chocolate truffles. I had to make a small batch because I knew I would be tempted to eat all of them! I used dairy free chocolate chips, and I promise you will never know the difference. This recipe make about 2 dozen balls. In a large bowl, mix together butter, peanut butter, and sugar. Mix well. Stir in rice cereal just until incorporated. Chill the dough 1 hour. Form dough into balls, about 1 tbsp. at a time. In the center of each ball, fold in a few mini chocolate chips using your fingers. Freeze the formed balls for about 2 hours. Heat the rest of the chocolate chips in a shallow bowl about 2 minutes in the microwave, stir to make sure chocolate is melted. Roll each peanut butter ball into the melted chocolate and place on wax paper. Sprinkle cinnamon sugar on top and put in the fridge. Serve when the chocolate has hardened again.